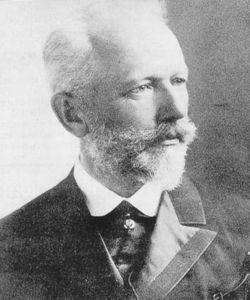 Pyotr (Peter) Ilyich Tchaikovsky (25 April [7 May] 1840 – 25 October [6 November] 1893) was one of the most popular Russian composers of all time. His music has come to be known and loved for its distinctly Russian character as well as for its rich harmonies and stirring melodies. His compositions are among the most frequently performed in the world. Tchaikovsky composed 7 symphonies, 11 operas, 3 ballets, 5 suites, 3 piano concertos, a violin concerto, 11 overtures, 20 choral works, 4 cantatas, 3 string quartets, a string sextet, and over 100 songs and piano pieces. Yet he was criticized by Russian critics for being insufficiently nationalistic, and all the while was obliged to conceal his homosexuality. His disastrous marriage was the subject of Ken Russell's 1970 film The Music Lovers. Tchaikovsky was born to a middle class family Votkinsk, Russia. He went to St. Petersburg to study law before being taught music at the St. Petersburg Conservatory. Among his mentors was Russian composer and pianist Anton Rubenstein. Tchaikovsky became professor of harmony at the Moscow Conservatory, where he met dramatist Aleksandr Nikolayevich Ostrovsk, who wrote the libretto for the composer's first opera, The Voyevoda. He also wrote his first symphony, Winter Daydreams. Symphony No.1 in G minor, OP.13 "Winter Dreams"
Symphony No.2 in C minor, Op.17 "Little Russian"
Symphony No.3 in D major, Op.29 "Polish"
Symphony No.6 in B minor, op.74 "Pathetique"
This page was last modified 09:31, 13 September 2013.